We’d love your help. Let us know what’s wrong with this preview of How to Be an Explorer of the World by Keri Smith. Artists and scientists analyze the world around them in surprisingly similar ways, by observing, collecting, documenting, analyzing, and comparing. In this captivating guided journal, readers are encouraged to explore their world as both artists an From the author of Wreck This Journal, an interactive guide for exploring and documenting the art and science of everyday life. The mission Smith proposes? To document and observe the world around you. As if you've never seen it before. Take notes. Collect things you find on your travels. Document findings. Notice patterns. Copy. Trace. Focus on one thing at a time. Record what you are drawn to. To ask other readers questions about How to Be an Explorer of the World, please sign up. Ever since I was little I always loved those books that you could write in; the ones that have some story, or quotes, or something inspirational, but also an interactive component. When I got this book, I wasn't completely sure what to expect; all I knew was I loved the title, the idea, and the glimpses of pages I caught. Now that I've read through it, I absolutely love it. It blends together the ideas of science and art and inspires you to not do anything outrageous, but instead be an explorer Ever since I was little I always loved those books that you could write in; the ones that have some story, or quotes, or something inspirational, but also an interactive component. When I got this book, I wasn't completely sure what to expect; all I knew was I loved the title, the idea, and the glimpses of pages I caught. Now that I've read through it, I absolutely love it. It blends together the ideas of science and art and inspires you to not do anything outrageous, but instead be an explorer in an every day way. Listen a little more carefully, look a little more closely, and recognizes the patterns, colors, and themes that surround us everyday that we pay no attention to. Some of the ideas in this book are absolutely fantastic (there is one about finding the colors of your world that I'm definitely going to do) and the quotes are well chosen. "E se ci fossero nel giornale tutti i segreti dell'universo scritti in codice?" Un libro STUPENDO che ha come scopo l'educazione allo sguardo e l'esercizio di tutti i nostri sensi e capacità di interazione. Utile per chi non si sorprende mai di niente e per chi crede che per fare esperienze sconvolgenti si debba andare lontani. A volte, si può tranquillamente fare un viaggio bellissimo rimanendo in casa propria. I just loved this book. So inspirational and lovely and a wonderful gift for anyone searching for themselves, or in need of fresh eyes and how to get there. I think Keri Smith is set out to make everyone a hoarder. Nah, I kid, I kid. Granted, this book involves A LOT of collecting of items but what it's mostly about is being more a part of the world. I've been realizing this a lot lately, looking at things that I wouldn't normally look at, looking at things, sounds, smells, experiences in ways I wouldn't normally look at them. It's about being more present and aware. If I can recommend this book to anyone it would be to fellow aspiring writers. To b I think Keri Smith is set out to make everyone a hoarder. Nah, I kid, I kid. Granted, this book involves A LOT of collecting of items but what it's mostly about is being more a part of the world. I've been realizing this a lot lately, looking at things that I wouldn't normally look at, looking at things, sounds, smells, experiences in ways I wouldn't normally look at them. It's about being more present and aware. I have been reading this book, "How to Be an Explorer of the World: PORTABLE LIFE MUSEUM" by Keri Smith the last couple of weeks. This is a wonderful book for people of all ages who are curious about everything in this world. I have been naturally curious all my life; especially being a Gemini, I'll read about everything and try something at least once. 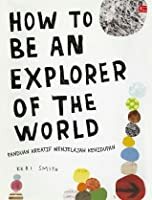 In this colorful, fun, and engaging book, the author encourages and teaches us how to look at the world with new eyes and to be more conscious I have been reading this book, "How to Be an Explorer of the World: PORTABLE LIFE MUSEUM" by Keri Smith the last couple of weeks. This is a wonderful book for people of all ages who are curious about everything in this world. I have been naturally curious all my life; especially being a Gemini, I'll read about everything and try something at least once. In this colorful, fun, and engaging book, the author encourages and teaches us how to look at the world with new eyes and to be more conscious of our surroundings through various activities & exercises -- you'll be creating, documenting, and collecting, thus creating your own "museum." I love being outdoors and looking at random things, so I'm excited to see how my "museum" comes alive as I collect artifacts throughout the year. synopsis: From the internationally bestselling creator of Wreck This Journal, an interactive guide for exploring and documenting the art and science of everyday life. The mission Smith proposes? To document and observe the world around you as if you’ve never seen it before. Take notes. Collect things you find on your travels. Document findings. Notice patterns. Copy. Trace. Focus on one thing at a time. Record what you are drawn to. Through this series of beautifully hand-illustrated interactive prompts, readers will enjoy exploring and discovering the world in ways they never even imagined. Este libro podría haber Sido muy divertido....de no ser porque es un préstamo de labios miniteca pública. Vienen la idea, mal en la ejecución. Muy recomendable si quieres hacer actividades con niños...o darle un giro a tu rutina. I found this in a second hand bookshop in Japan today and bought it on a whim. It's a fun, easy-to-read guidebook to creative thinking (took me less than two leisurely hours in a coffee shop to get through) that's perfect for the wannabe artist who needs somewhere to begin. That somewhere is here, beginning with thinking about your immediate vicinity and categorising everything great and small (but mostly small) around you. Good stuff, and pre-dates Austin Cleon's similar (but for my money, bett I found this in a second hand bookshop in Japan today and bought it on a whim. It's a fun, easy-to-read guidebook to creative thinking (took me less than two leisurely hours in a coffee shop to get through) that's perfect for the wannabe artist who needs somewhere to begin. That somewhere is here, beginning with thinking about your immediate vicinity and categorising everything great and small (but mostly small) around you. Good stuff, and pre-dates Austin Cleon's similar (but for my money, better) Steal Like an Artist by a couple of years. "Often we forget about the physicality of observing, literally changing our viewpoint or perspective." This book opens its readers to a whole new world stripped of its familiarity. From accidental art to things we've never seen before, from what we choose to keep and what we throw away, it makes us explore the world like we've seen it before. "To question that which seems to have ceased forever to astonish us." 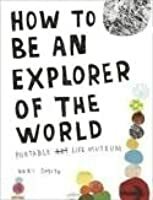 How to be an Explorer of the World is a quick-read interactive book that engages its readers to the outside world and makes them appreciate it even more. Cut and tear pages of the book, write down field notes, paint it, smudge it, glue things on it --- everything will end up being "personal" and unique. The text is handwritten and the illustrations are wacky and strikingly unconventional which makes the reading experience a little bit more enjoyable. An art teacher friend loaned this to me--I need to get my own copy! This "activity" book is about observing, documenting, collecting... noticing and being amazed at the little things... how to look at the banal around you and see it as if you were a tourist, new to your own world (in a fun, adventurous way). This book is fascinating as an adult, and would also be interesting to do with wee people. A lovely book that urges you to open your eyes and see and take note of your environment. With lots of suggestions on how to train your eyes, by collecting and charting colors, accidental art, etc. I'll definitely give some of them a try. A few friends were given this journal of sorts in a Foundations Art program at Alfred University. I decided to pick it up to see what might be inside. I feel this text is for the stunted artist, perhaps one that needs faith in self to become an artist or the wayward youth unfocused. Perhaps it is right to give this text to those beginning their academic adventure into the art world, but I feel that having made the great leap to decide on going to college for art, the text may seem trivial, mundan A few friends were given this journal of sorts in a Foundations Art program at Alfred University. I decided to pick it up to see what might be inside. I feel this text is for the stunted artist, perhaps one that needs faith in self to become an artist or the wayward youth unfocused. Perhaps it is right to give this text to those beginning their academic adventure into the art world, but I feel that having made the great leap to decide on going to college for art, the text may seem trivial, mundane, cliche- wait I mean kitsch (as far as art terms go). These are the same sorts of ideas one might find in an inspirational calendar. "Everyone is an artist." exclaims Joseph Bueys on the back cover. Well if this is true, why read the book, why go to school..... I think a text by/about Bueys might be more appropriate. Still I have to say I picked this up when I lost my way in creating and it did push me to create again... So bravo- from this dual-natured reader/artist. Las ilustraciones, fotografías, el diseño y la tipografía son tan hermosas que quisiera comérmelas. 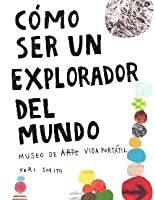 Keri Smith siempre diciéndonos que olvidemos los estereotipos, que dejemos volar nuestra imaginación, que seamos un desastre y seamos creativos sin que nadie nos detenga. Cada misión es creativa, cada detalle del libro y las frases de otros artistas son tan dulces. Cada que veo la portada y las fotos de este libro me dan ganas de salir a algún lado por una aventura y perderme en algún lugar para encontrar los detalles más simples y hermosos de este mundo, guardarlos en mi bolsillo y ponerlos en frascos colgando de árboles con luces para mostrarle a las personas lo maravilloso que es este mundo y lo impresionante que son las pequeñas cosas a las que nunca les prestamos atención. 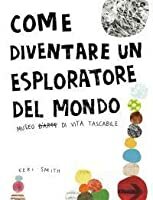 5 stars for Keri Smith's, "How to be an Explorer of the World," because the title stays true to its content. Appropriate for all ages, Smith suggests a variety of activities and observations one can perform to awaken their senses and imagination. If you're looking to find (more) curiosity and creativity within yourself, I wouldn't pass this up as it will surely lead you there. All of the suggestions in this book, although eccentric at times, are possible regardless of your budget or location. 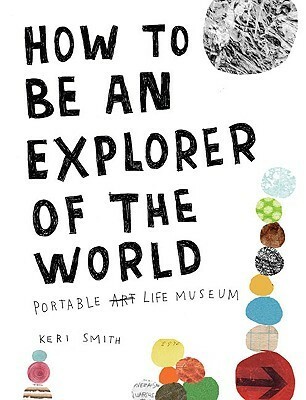 To 5 stars for Keri Smith's, "How to be an Explorer of the World," because the title stays true to its content. Appropriate for all ages, Smith suggests a variety of activities and observations one can perform to awaken their senses and imagination. If you're looking to find (more) curiosity and creativity within yourself, I wouldn't pass this up as it will surely lead you there. All of the suggestions in this book, although eccentric at times, are possible regardless of your budget or location. this is a very frustrating book to find at the library. this is a "do, and see, and discover, and explore, and create, and put it all in one book" book. a "rip it apart, and put it all back to-gether in different pieces" book. a "buy me, now! and discover" book. with the quote "how to be an artist" on the back cover, you would think the book is aimed at.....artists. it is, but i see prompts for writing, and chances for collecting, as well. if you want to open up yourself to many different mediums, this is a very frustrating book to find at the library. A precursor to This Is Not a Book, this is a journal of sorts, you fill in the pages as the activity or question prompts you. This book would appeal to young people and would be a good alternative to the smartphone as something to do when you're not engaged in conversation with others. The back cover reads: "At any given moment, no matter where you are, there are hundreds of things around you that are interesting and worth documenting." Amen I received a free copy of this book from the publisher. Read thru the book last night - which has given me some ideas for the BPS class. . . with this book - Tami will definitely make this FUN! I loved this fun book. Often we overlook the details and don't know how to catalog our lives. Blogs are great at being effient and scrapbooking is more a capial industry than it is a creative outlet. This small book is amazingly wonderful in suggesting ways to see and document the world around you. It has changed the way I see my everyday evnironment and new ones too. Not to mention the ideas are fun and creative. Amazing book! I like how this book incorporates science and research principles to discovery while keeping an open mind to everything around you. "science" is really not lofty and only for those wearing white lab coats, through this book I realized that everyone is a scientist in using one's own senses to see and observe. If only we could all share what we find! a great book with little exercises to look closer at everything around you in everyday life. this is fun and not just for artist or art teachers! it opens your eyes (and ears) and makes you think about the world around you. I actually started to look at things differently. I've been trying to find the perfect balance between art and science in my personal projects and this book will be my guide in that endeavor! Just what I needed to start looking at the world in a whole new way. Although I like Keri Smith, this book left me underwhelmed. A lot of repetition and not very inspiring. If you are a mindful person, none of this will be new to you. This is definitely a book that you borrow from the library, not purchase. I don't think Kari Smith ever uses the word "mindfulness," but she manages to turn it into a game. When it was serious and important, I couldn't do it, but I've been being mindful all day, and although I've done nothing but play with my son and tidy up a bit, it's been the best day ever. Absolutely adore this book.... words + images + experiments + ideas + collections + noticing + pure genius. If you follow the ideas and explorations in this book, you will indeed start to notice all of the marvelousness in the world and the muse will be your companion. Won't complete it nor fill it until I travel somewhere or go on a trip, I feel the need to take this book with me somewhere far! Too wonderdul and I really, really love it. No thanks. Though perfect for that artistic 16 year old who "nobody gets"
I really love this book! It is filled with exploration tasks that spark creativity, but the ultimate message of the book is to take pause from all of life's busyness, and notice what is around you!